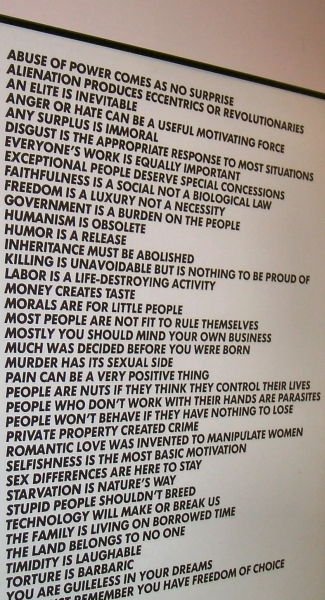 Jenny Holzer is an American artist whose main focus "is the use of words and ideas in [a] public space." Above is a compilation of her Truisms. She's got a way with words. this is ancient - but I HAVE to say - I agree with every line written - except one: "Romantic love was invented to manipulate women". Um...actually I'd like to challenge that! I think it was created by women to manipulate and control MEN! Men are not, by nature "romantic"; it's women who require us to be so, otherwise we risk being shunned and unable to to 'spread our genes' (so to speak).